Ok, so I can admit that I do secretly like good ole fashioned American potato salad, but I’ve never been able to bring myself to make it. 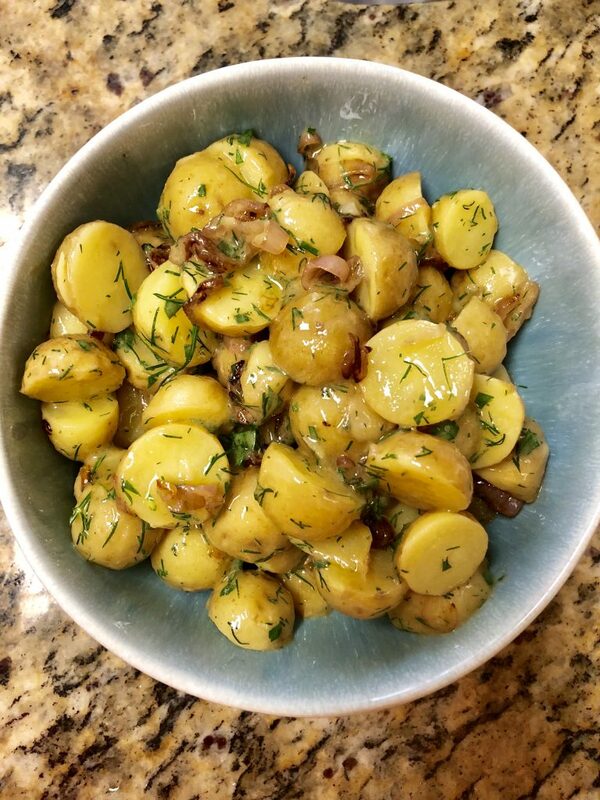 Whenever I’m looking for a fun potato side in the salad category, I turn to this Potato Salad with Crispy Shallots recipe. Since it’s a vinaigrette based recipe, there’s no issue with bringing it to cookouts and having it sit in the heat 👍 All in favor of no food poisoning 🖐 Give it a try and see if it makes its way to your next family gathering 🙂 This will definitely be on my table for the 4th of July! 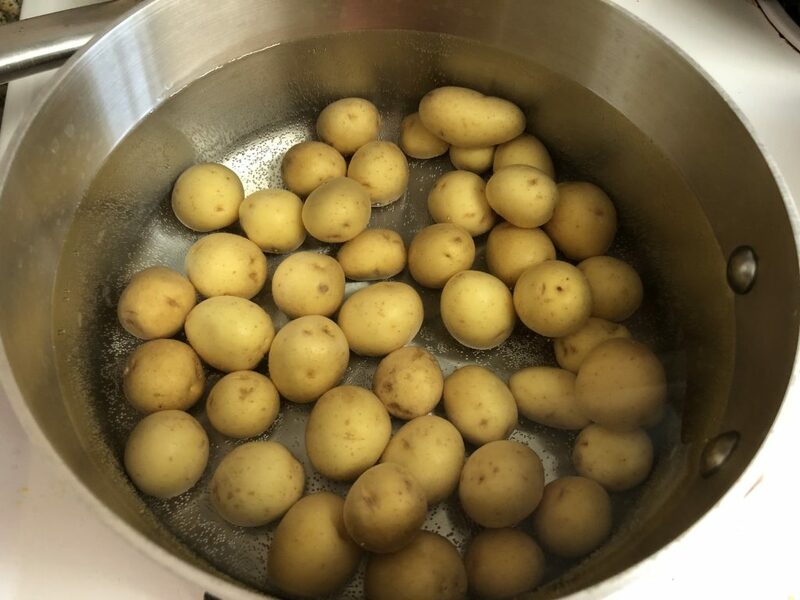 Place the potatoes in a large pot and cover with cold, salted water. 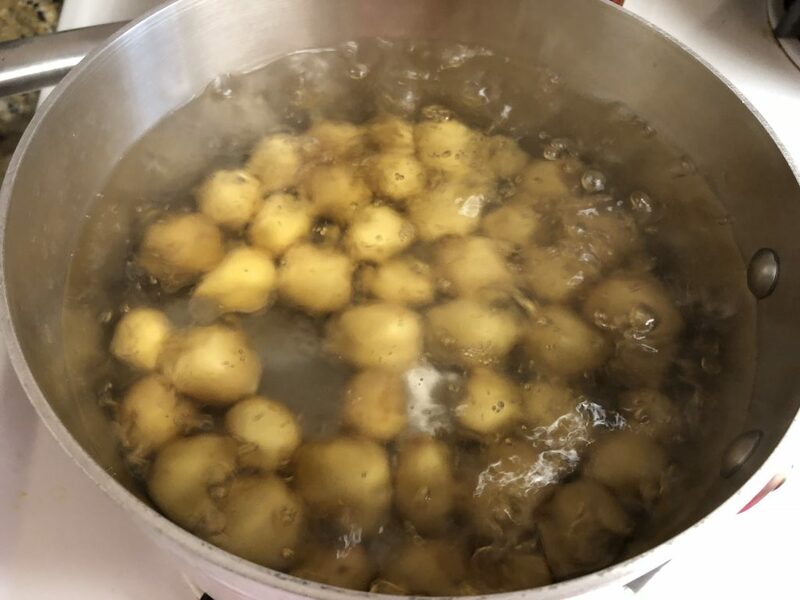 Bring to a boil and cook until the potatoes are tender, approximately 20 minutes. 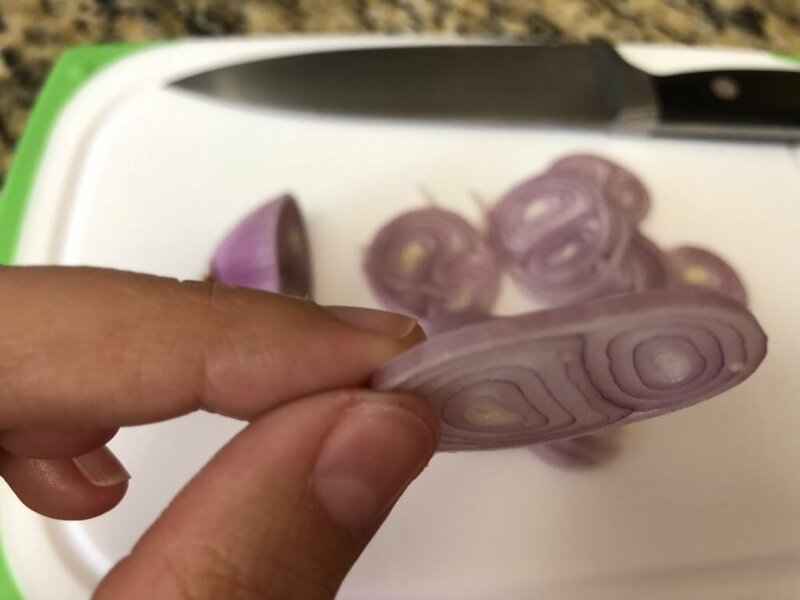 TIP: If you can easily stab the potatoes with a fork, they are ready! Drain in a colander (strainer). 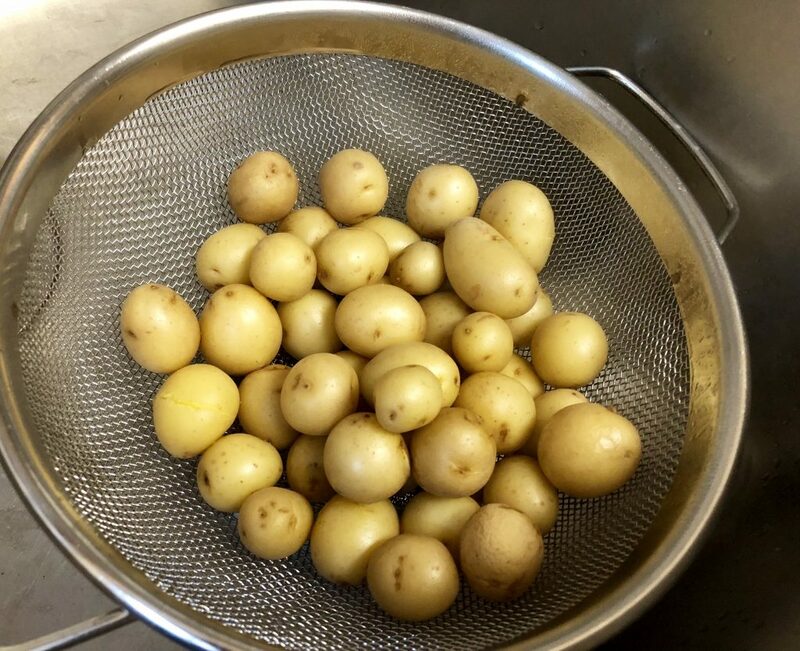 When cool enough to handle, cut each potato in half and move the potatoes to a large mixing bowl. 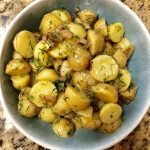 If you are already using micro potatoes, you can skip this step if you’d like! Set aside. In a small frying pan, heat one tablespoon of olive oil over med-high heat. 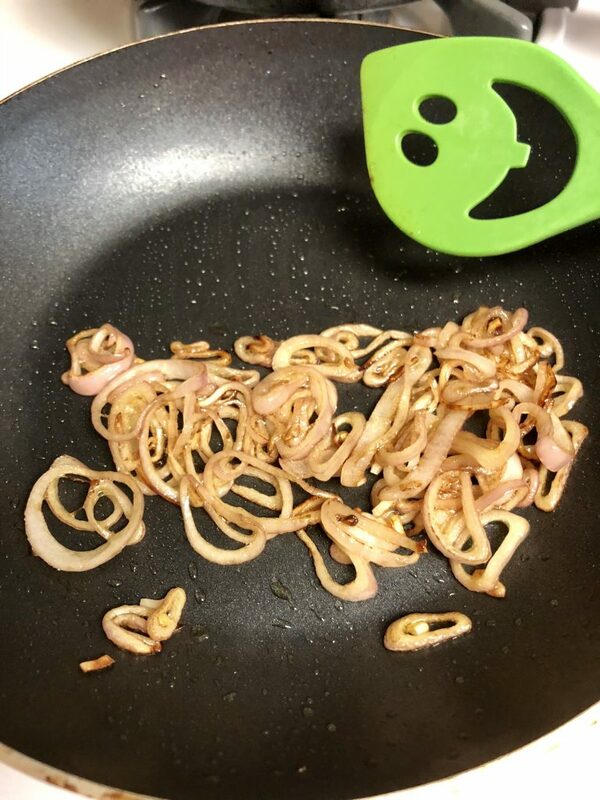 Saute the shallots until crispy. 1 -2 minutes. Remove from heat and set aside. The greatest wooden spoon of all time! In a small bowl, combine the red wine vinegar, mustard and maple syrup. 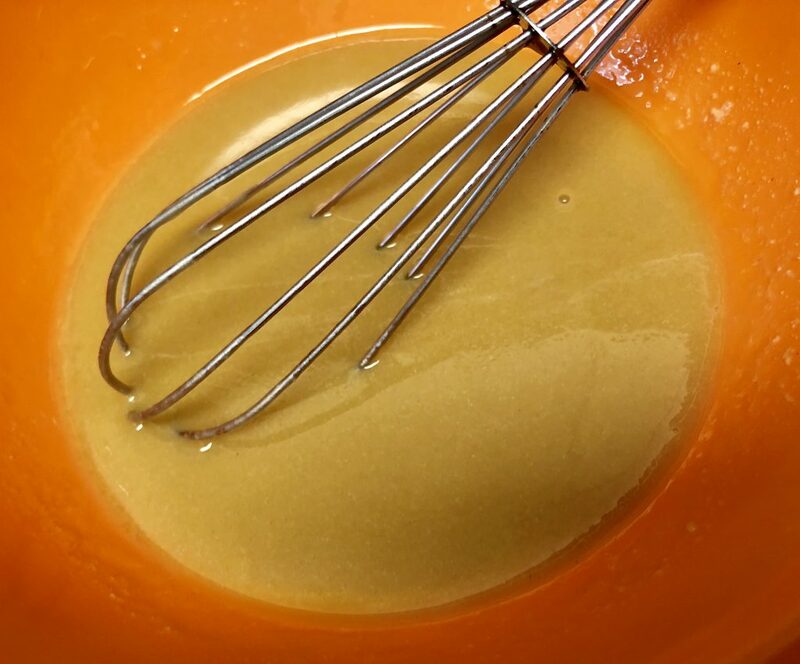 While adding the olive oil in a steady stream, whisk the dressing together until emulsified. Set aside. 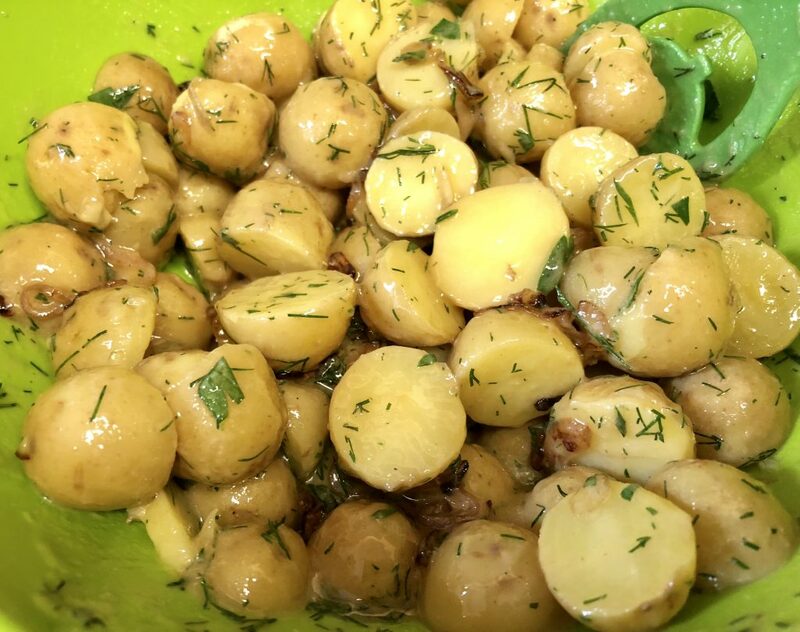 Add the parsley and dill to the potatoes and mix. Pour the vinaigrette over the potatoes and mix gently. 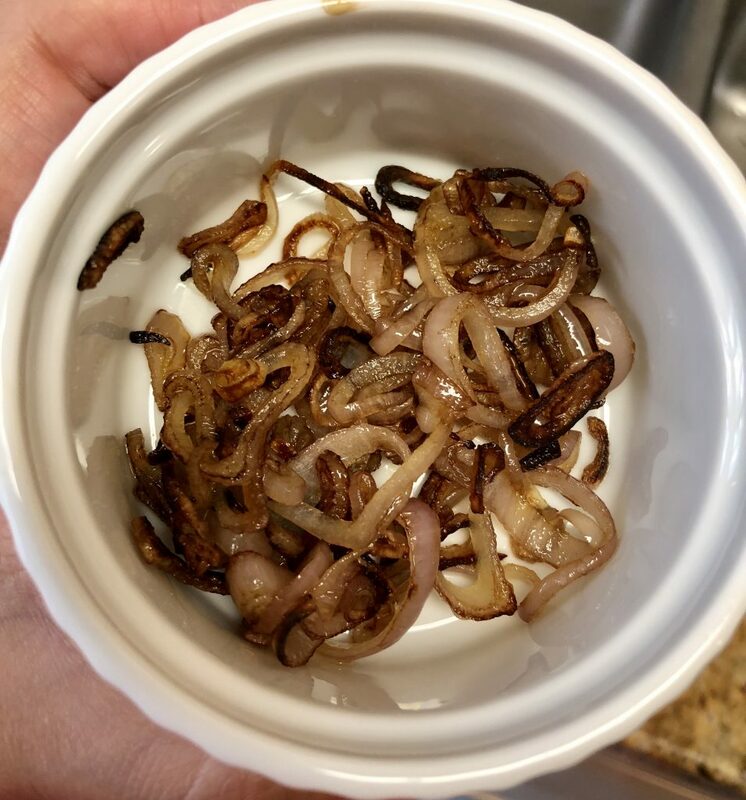 Add the crispy shallots on top. Happy Summer!! I hope this Potato Salad with Crispy Shallots makes it into your list of summer staples! 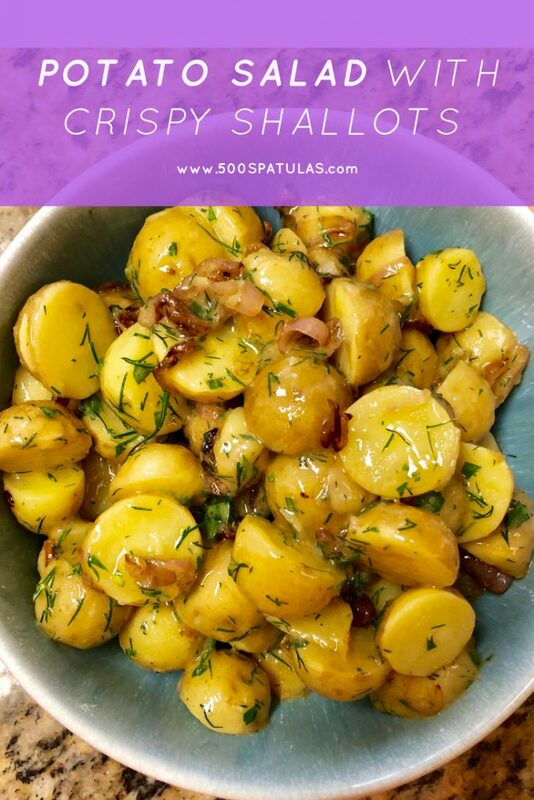 Bring to a boil and cook until the potatoes are tender, approximately 20 minutes TIP: If you can easily stab the potatoes with a fork, they are ready! 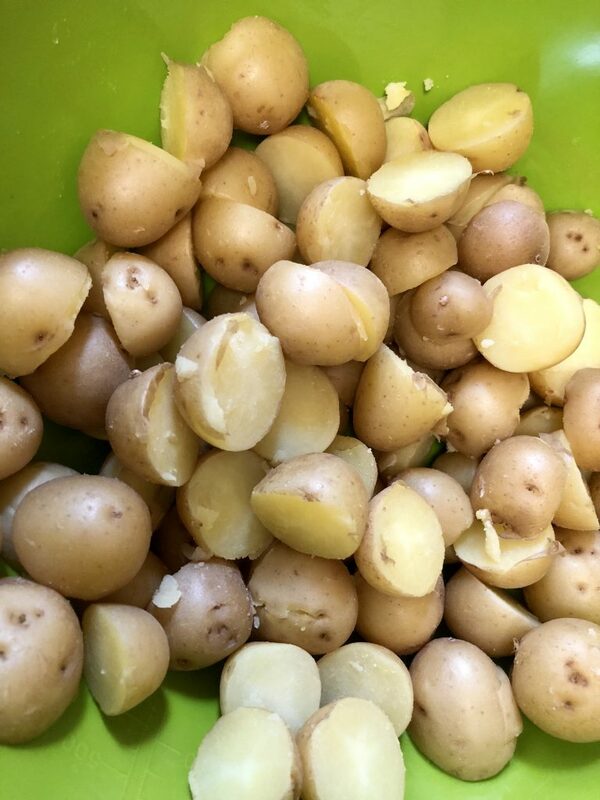 When cool enough to handle, cut each potato in half and move all potatoes to a large mixing bowl. Set aside. In a small frying pan, heat one tablespoon of olive oil over med-high heat. 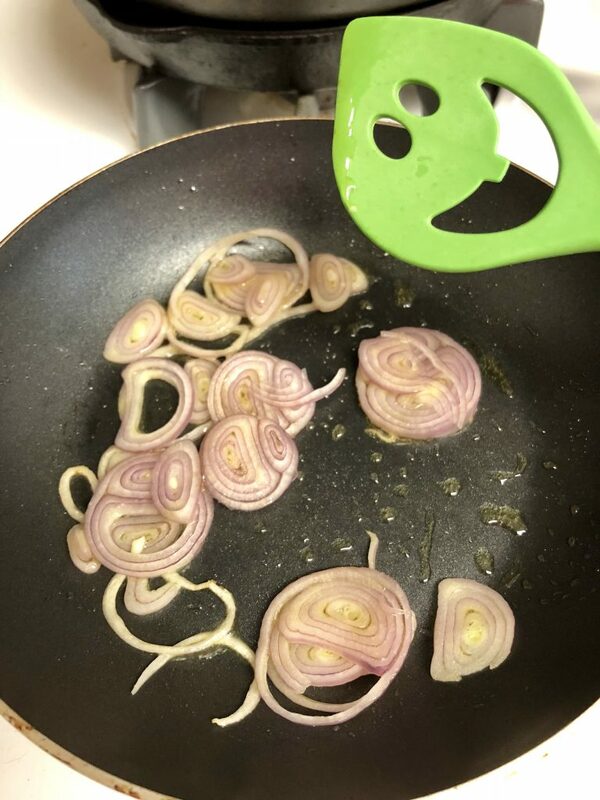 Saute the shallots until crispy. 1 - 2 minutes. Remove from heat. In a small bowl, combine the red wine vinegar, mustard, and maple syrup. While pouring the olive oil into the bowl in a steady stream, whisk the dressing together until emulsified. Set aside.